Seasonal warfare was an integral part of the pattern of Wendat life. Archaeological evidence shows that the St. Lawrence Iroquoians had been bitter enemies, particularly among the Wendat who lived in the Trent Valley in the 16th century. Some have actually speculated that the Wendat may have been responsible for the disappearance in the 16th century of Hochelaga, the village site on which the modern city of Montreal now stands. The eastern members of the Five Nations may, however, be more likely perpetrators of this violence. Nonetheless, archaeological evidence suggests a longstanding rivalry between the eastern Wendat and Hochelaga. The people of the Trent Valley were also likely involved in conflict with the Onondaga. Oral accounts also tell of hostility between the Wendat and Tionontatehronnon. This conflict was settled before the arrival of the French in the early part of the 17th century. A people’s enemies were, to a large extent, determined by geography. Proximity to a given neighbour did not necessarily determine that they would constitute an enemy but distance decreased the likelihood of hostilities. In general, an enemy would be a close neighbour and groups farther away were less threatening. Geography played a large part in determining one’s enemies but cultural and economic factors were the final determinants. Surprisingly, similarities in culture did not tend to bind peoples together. In many instances, similarities created rivalries rather than partnerships. The Haudenosaunee and the Wendat shared many common cultural traits. In terms of trade, both their needs and what they had to offer were similar. Neither seemed to have much that the other could not produce or acquire themselves. They, therefore, became rivals for the same trade goods. Trade in the Americas took place over vast distances. Decorative shells came to the Great Lakes area from the Gulf of Mexico, native copper from the Lake Superior region and, in the 16th century, European goods came from the Gulf of St. Lawrence. This trade did not take place directly between two parties. Rather, a number of intermediaries or middlemen were established. Complex systems of trade existed to move items from nation to nation over immense distances. Wealth and status accrued for those who acquired middleman status. Neighbours often blocked access to distant sources of trade. Trade, therefore, bred territorial disputes and jealousy among various peoples. Conflict between the Haudenosaunee and the early Wendat was strongly influenced by geography. The most easterly members of the Five Nations, the Mohawk, waged war on the St. Lawrence Iroquoians. The Onondaga lived farther to the west and fought with the Wendat in the Trent Valley. The Seneca and Cayuga, the most westerly nations of the confederacy, were likely foes of the early Wendat along the north shores of Lake Ontario. This conflict may have been brought north when the southern Wendat moved to be close to their allies the Attignawantan on Georgian Bay. Archaeological evidence of increased hostilities with the Seneca and Cayuga appears in the middle of the 16th century. The Seneca remained the chief opponent of the Wendat but, with the increased rivalry caused by the trade in European goods, the former were able to involve the other members of the Five Nations Confederacy in the struggle. Warfare was, for the most part, a low-level affair for indigenous North Americans when compared to modern concepts of total war or even contemporary European standards. Conflict was often motivated by a desire for revenge for past transgressions. Warriors sought status by demonstrating their bravery in war. The economic motivations for war discussed above combined with a cultural need for warfare created a cycle of violence and traditional enemies. Capturing prisoners was a prime objective in this kind of warfare. Male prisoners were usually taken back to the captors’ villages, tortured and killed. Young women and children were adopted into the captors’ community. The reason for this was less to do with concepts of chivalry than with a need to increase the population. 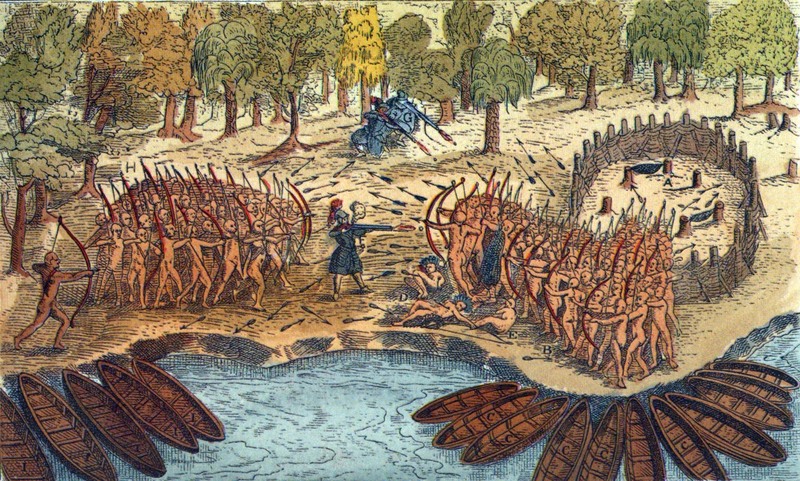 The Haudenosaunee-Wendat conflict was one of long standing by the 17th century but it remained at traditional levels of intensity until the arrival of the French. The trade and military alliance between the Wendat and the newcomers appears to have exacerbated the hostility of the Haudenosaunee toward their northern cousins. The involvement of the French in hostilities beginning in 1608 likely outraged the Haudenosaunee. The addition of this new powerful force to those of the confederacy’s traditional foes must have been a bitter pill. First Nations peoples rapidly became dependent on European trade goods. This dependence produced an increase in trade activity in the early 17th century. The Mohawk had easy access to European trade goods at Fort Orange in the Hudson River Valley and could even trade with the English if the Dutch failed to satisfy their needs. This access to Fort Orange was enjoyed to a lesser degree by the other nations of the confederacy. The distribution of wealth from the fur trade was uneven among the Five Nations. The Mohawks in particular developed a voracious appetite for European goods that could not be sustained by the production of beaver pelts in their territory. This shortfall was supplemented by pillage. Whereas the Wendat sought to trade with their neighbours to acquire furs, the Mohawk took to intercepting trading parties on the Ottawa and St. Lawrence Rivers to acquire sufficient pelts. The difference in approach between Mohawk and Wendat is a factor of geography and culture. Trade and co-operation with the hunter-gatherers of the Canadian Shield country was part of the pattern of Wendat life. Such a pattern did not exist in the case of the Mohawk. The Algonkians to the north and east of the Mohawk Valley were among the traditional enemies of the nation and raiding rather than trading seemed the appropriate approach. In this way, the traditional warfare that existed between the Mohawk and their neighbours was combined with the economic activity of acquiring pelts for trade with Fort Orange. So successful had their raiding been in previous decades that, by the 1630s and 40s, the Mohawk were able to hunt in Algonkin territory. The attacks of the Mohawk and Oneida in the Ottawa and St. Lawrence Valleys threatened to cut trade between Wendake and New France and scatter the Algonkin and Montagnais peoples. A more direct conflict developed between the western Haudenosaunee and the Wendat. With less access to the trade routes than the two eastern nations, the Seneca, Cayuga and Onondaga continued to raid the area of Wendake itself. The pattern of this warfare was little changed from that which had existed in the pre-contact period until the 1640s. An increase in the demand for furs combined with the acquisition of a large number of guns seems to have encouraged the Seneca, in particular, to contemplate the destruction of Wendake around 1646. The western nations of the confederacy had become bolder in their attacks beginning in the 1630s. By the early 1640s, they were raiding the Wendat homeland in force and acquiring furs and European goods through the destruction of Wendat settlements. Some disharmony existed within the Haudenosaunee confederacy. In general the nations pursued their own policies as pertained to war and relations with neighbouring peoples. The confederacy was largely established to keep its members from attacking each other. Mutual self-defence was a secondary function. The confederacy did not lend itself to concerted aggression. By 1646, however, the Mohawk were convinced to join the western members in direct attacks on Wendake. Even this moment of convergence was ruined when the Onondaga declared a separate peace with the Wendat in 1647. The defection of the Onondaga temporarily derailed the plans of the Seneca to destroy Wendake. The Onondaga, however, abandoned their peaceful path in 1648 and resumed their attacks. Despite the best efforts of the Wendat warriors, Haudenosaunee raiders roamed at will in Wendake. Attacks were concentrated at first in the Arendarhonon territory in the far east of Wendake. By the mid 1640s it had become dangerous to travel between villages or for women to tend fields. Panic began to spread even in the, so far, unaffected west. Contarea, the main village of the Arendarhonon, was abandoned in late 1647, as was most of the eastern territory. The attacks then shifted to the Tahontaenrat and Attigneenongnahacs. In 1648, Teanaostaiae, one of the largest and best-protected Wendat villages was attacked and destroyed with a tremendous loss of life. The attacks had cut Wendat trade with New France, prevented Wendat women from tending their crops and prompted a large number of refugees to flee west. The Wendat seemed completely incapable of resisting. Militarily, the Haudenosaunee had an advantage in that they had managed to acquire many guns from the Dutch. The French had been more reluctant to provide muskets to their allies than had the Dutch and, when they had made the weapons available, they were only sold to Christian converts. The deployment of this weapon does not, however, fully explain the defencelessness of Wendake. The Haudenosaunee attacked the various nations of the Wendat Confederacy one at a time. This strategy encouraged those who had not been attacked to hope that they might be spared. The natural divisions of any confederation were exploited by the Haudenosaunee and the collective effort of the Wendat was found wanting. Under pre-contact circumstances this may not have occurred but Wendat society was rife with conflict between Traditionalists and Christians. The incredible destruction caused by European disease may have weakened the will of the survivors and made them question their traditional ways of life. The Haudenosaunee had been devastated by plague too but likely not to the extent of the Wendat. The Haudenosaunee, furthermore, had been able to compensate for some of their losses by adopting prisoners. In the summer of 1648 the Wendat were successful in reaching Trois-Rivières with their annual load of pelts. This achievement was compounded by victory in an encounter with Mohawk raiders en route. The following spring, however, more disaster awaited Wendake. On March 16th, Haudenosaunee warriors surprised the inhabitants of Taenhatentaron. Normally, an attack would not have been expected until well after the passing of winter but these warriors had spent the winter north of Lake Ontario in order to surprise the Wendat. Taenhatentaron was well fortified but most of its inhabitants had fled and those who remained were caught off guard. The Haudenosaunee followed this success with an assault on St. Louis. The inhabitants had been warned and most had fled. The warriors who remained defended stoutly but were eventually overcome. The confederacy was able to mobilize sufficient warriors to force a withdrawal by the invaders but the loss of the two villages was sufficient to convince the remaining Wendat that their homeland was no longer tenable. Evacuation and dispersal began immediately. The Tahontaenrat were the only nation to flee as a whole, seeking shelter among the Neutral. The other groups divided into small parties, some going to the Tionontatehronnon, others to the north where they hoped to avoid detection by the Haudenosaunee. One group moved to Gahoendoe, an island in Georgian Bay now known as Christian Island. Famine stalked these refugees, as they had not managed to harvest a crop in 1648 and abandoned their cleared fields early in 1649. Despite hardship, the refugees on Gahoendoe managed to clear some fields and build a fortification with the help of the Jesuits who had left Sainte-Marie. Efforts were made to establish a permanent settlement but the lack of supplies and exhausting effort of clearing fields and beginning afresh combined with the inadequate resources of the island doomed these efforts. The Haudenosaunee meanwhile had returned to Wendake and slew anyone they found including those from Gahoendoe who were forced to forage on the mainland. The new settlement, named Sainte-Marie II by the Jesuits, was flooded with more refugees throughout the summer and fall. A poor growing season in the summer of 1649 sealed their fate. Disease, hunger and cold took a terrible toll on the refugees in the winter of 1649. Many who managed to avoid death on the island were killed making desperate bids to find food on the mainland. The Haudenosaunee patrolled not only the shores of Georgian Bay but raided as far as Lake Nipissing in pursuit of plunder and prisoners. Of perhaps 6000 who had taken shelter on Gahoendoe approximately 600 survived. 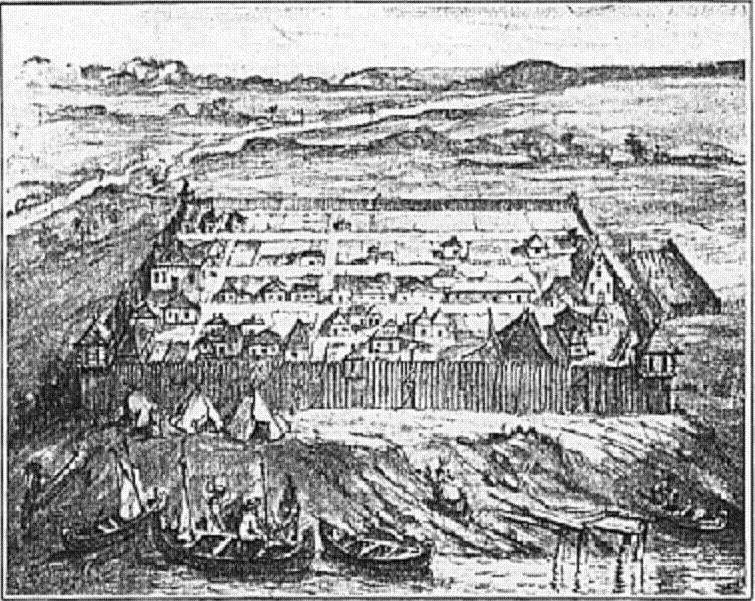 In June of 1650, about 300 of the survivors accompanied the Jesuits to Quebec. The remaining 300 stayed on the island in order to harvest the crop. They were to have followed but remained on the island until the spring of 1651. There was no hope of a return to Wendake and refuge was nowhere to be found north or south. Finally they were reunited with their relatives in Quebec. Apart from Gahoendoe, the villages of the Tionontatehronnon offered the closest haven for Wendat refugees. The Attignawantan, in particular, seem to have favoured this option. The choice of Tionontatehronnon versus Neutral or Nipissing refuge appears to have been largely dictated by ties of friendship mainly established through trade. The Tahontaenrat, as we have seen, moved en masse to the Neutral with whom they had close trading relations. The population of Tionontatehronnon villages swelled throughout the summer of 1649. The Haudenosaunee were determined to destroy the Wendat absolutely. They may, indeed, have determined to rid the entire region of rivals. On 5 December 1649, a party of 300 Haudenosaunee warriors arrived in Tionontatehronnon country and found its main village, Etharita, unprotected. The warriors of the village had been given warning of the approaching Haudenosaunee and had set out to meet them. The Haudenosaunee managed to avoid the defenders and sacked and burned the defenceless village killing or taking prisoner the women and children who remained behind. When the disappointed warriors returned to Etharita, they were shocked to find it destroyed. Like the Wendat a few months earlier, they determined that their homeland was no longer defensible. The nation, including the Wendat refugees, fled west. They found refuge first at Michilimackinac but Haudenosaunee attacks forced them further west until they settled near the south shore of Lake Superior. Like many other groups that fled the Haudenosaunee onslaught, the Tionontatehronnon-Wendat found that they were not welcomed by the resident Sioux. Unsuccessful battles with these people led to a move back to the Michilimackinac area. Finally, in 1701, they were enticed by French explorer Antoine de Lamothe Cadillac to move to the environs of Fort Pontchartrain, present day Detroit. The Haudenosaunee menace had subsided by this point. Their settlements in southern Ontario had been abandoned and the era of Haudenosaunee hegemony in the Great Lakes region was over. The Tionontatehronnon-Wendat, along with the Ojibwe, Odawa and Potawatomi, now felt safe to occupy a site so close to their previous enemies. The fifty years of wandering in the Upper Great Lakes had transformed the Tionontatehronnon-Wendat. They had come to be known as the Wyandot, a corruption of Wendat, and their ordeal had radically altered their way of life. The harsh climate of the Upper Lakes was not conducive to the patterns of agriculture that had been practised in Wendake and the Tionontatehronnon lands. The Wyandot became much more like the Odawa, Ojibwe and Potawatomi with whom they associated. The group attempted to revive the fur trade, no doubt, motivated by the Wendat minority, but their numbers were too few to allow them to control the trade. The far more numerous Odawa and Anishinaabe were able to take over the role of middlemen. Despite this diminution of status, the Wyandot were able to take some part in the revived trade. The Wyandot lived for almost one hundred and fifty years in the Detroit area. During this time all memory of separate identities disappeared and the Wyandot came to think of this area as their ancestral homeland. Events such as Pontiac’s Rebellion washed over the area and the Wyandot were sometimes able to play a role disproportion to their small numbers. At the end of the 18th century, however, the area came under intense pressure from the American government. The Wyandot attempted, at first, to remain neutral in the War of 1812 but were eventually convinced to join Tecumseh and his confederation against the Americans. After the War, settlers moved closer and closer each year and the ability of First Nations peoples to defend their lands diminished sharply. The American government adopted a policy of removal to deal with aboriginal people. Tracts of land would be purchased from the various nations, often with the help of coercion or trickery, and the inhabitants would be moved to west of the Mississippi. In 1842, the Wyandot sold the rights to their lands in the Ohio Valley and on the Detroit River and were resettled in Kansas. The second half of the 19th century was a time of exponential growth for the United States and the lands in Kansas were soon required for settlement. The Wyandot were moved again to Oklahoma. Though some managed to remain in or return to Kansas, Oklahoma remains the home of the majority of American Wyandot. The Oklahoma population refers to itself as the Wyandotte Nation. A small group of Wyandot, known as the Anderdon Band, chose to remain in British territory. They settled near the modern city of Windsor. Some of the families remain in this area but do not have a reserve. The small community has been particularly susceptible to the pressures of assimilation. Recent ties with other Wendat-Wyandot communities should lead to a stronger sense of their unique identity. The Wyandot were not the only survivors of Wendake to suffer in the fifty years after their expulsion from their homelands. In 1653, the French concluded a peace with the Haudenosaunee. Their perceived weakness made the French desperate to maintain this truce. The Haudenosaunee, meanwhile, had made peace with the French merely to gain control of the Wendat refugees from Gahoendoe who had taken shelter at Quebec. These refugees had been settled on the Île d’Orléans, just down river from Quebec. They were exposed to Haudenosaunee harassment and the French, in their determination to avoid conflict with the Haudenosaunee, did nothing to defend them. The Onondaga and Mohawk began to compete with each other in order to acquire the Wendat for resettlement in their homelands. Through negotiation and intimidation both competing parties managed to extort assurances that the Wendat would join them. 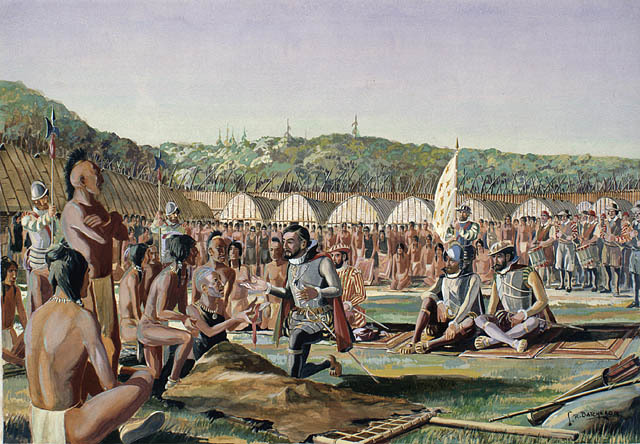 The Jesuits, it seems, encouraged the defection of the Wendat to the Onondaga as they had been promised missions in Onondaga country in return for their co-operation. Eventually, fifty Arendarhonon agreed to join the Onondaga and the Attignawantan infuriated the Onondaga by deciding to join the Mohawks. The Attigneenongnahac had determined to remain in Quebec. The passage of the Attignawantan was peaceful but during the course of their journey to Haudenosaunee country, the Arendarhonon were set upon by their Onondaga escorts. The men were killed and the women abused. The Jesuits accompanying the party did nothing to protect the Wendat and continued on their mission to Onondaga country. Finally, the French abandoned their passive attitude in the fall of 1657 and decided to defend the remaining Wendat. By this time their numbers had shrunk to under 200. The French moved those who remained a number of times. In 1673, they settled at Lorette. Their population began to grow again with the defection of some who had joined the Haudenosaunee. In 1675 they numbered about 300. Another move in 1697 took them to Jeune Lorette, the site they inhabit today. The rough road to survival for the inhabitants of Jeune Lorette has come at a price. The Wendat language and many customs have been lost. On the other hand, Lorette has been renamed “Wendake” to commemorate the origins of the inhabitants and, like indigenous peoples worldwide, they are taking a renewed pride in their heritage. The Wyandot (Wyandotte) of Oklahoma and Kansas, the Anderdon Band and the Wendat of the new Wendake represent a continuation of distinct Wendat cultures despite massive transformation. Most Wendat who survived the ravages of 1649 and subsequent destruction of places of refuge, however, were absorbed by their Haudenosaunee conquerors. Many were taken as prisoners but many more probably joined the Haudenosaunee by choice. With the destruction of the Neutral in 1651 and the Erie in 1657, there were very few options left to the refugees from Wendake. The Wendat joined the Haudenosaunee, in small groups for the most part, in order to be reunited with family members already living in Haudenosaunee villages. In at least one case, Wendat moved to Haudenosaunee country en masse. In 1651, a large group of Tahontaenrat founded their own village in the heart of Seneca country. In most cases, however, families in established Haudenosaunee villages adopted Wendat captives. They were often mistreated to begin with; some were even murdered. The Five Nations were, however, in great need of citizens to make up for the loss of population to warfare and European disease. The main purpose of bringing captives to Haudenosaunee villages was to turn them into productive members of society. The custom of adoption into a given family seems to have been largely successful in absorbing former enemies into Haudenosaunee communities. To be sure, some Wendat escaped from these circumstances and fled to Quebec in order to live among their own people but most remained. In fact, so many Wendat had been absorbed that most captives were living among their own people. The strongest bonds were to the family and the presence of other family members in their midst was enough to keep most Wendat from fleeing. Many adoptees came to identify with their captors in time. In short, the Wendat were quickly absorbed into Haudenosaunee society and the hatred engendered by years of warfare faded into obscurity.